#1 (Happy Meal 25th Bear), #2 (Burger The Bear), #3 (Birdie The Bear), 4 (Golden Arches The Bear), 5 (McNuggets The Bear), 6 (Ronald McDonald The Bear), 7 (Happy Meal The Bear), 8 (Shake The Bear), 9 (Hamburglar The Bear), 10 (Big Red Shoe The Bear), 11 (Fries The Bear), and 12 (Grimace The Bear). Still in sealed bags. 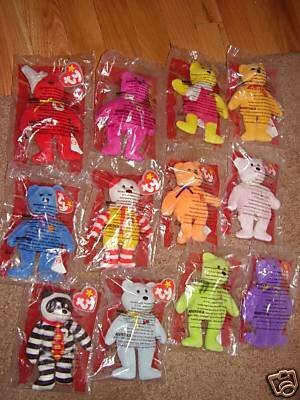 Items Similar To "McDonalds 25th Anniversary Set of 12 TY BEARS~Happy Meal~Sealed B..."